Over the last few decades, we have seen worrying increases in the exploitation of companion animals. Much of this is down to greed when demand is created for certain breeds. Thoughtless individuals can make thousands from the selling of puppies, many of which will go to totally inappropriate homes where they will later be discarded like an old pair of shoes. Animals are regarded by many as commodities rather than sentient beings. The number of pets ending up in rescue or euthanised as surplus to requirement has increased exponentially. If compulsory spay/neuter programs had been put in place along with tight controls on breeding, we would not have the problems we face today. It seems that the more rescues there are, the more dogs there are - are we, in fact, part of the problem? The public knows we exist so they know they can use rescue as a dumping ground for their unwanted pets, a place where they can offload their once much-loved pet without their conscience being pricked. Social media is awash with pictures and videos of extreme cruelty, particularly from the animal agriculture business. Yet people have become hardened to this extreme violence towards sentient beings, they also practice speciesism. They are appalled and disgusted by the dog meat trade in the far east yet have no qualms about eating the flesh of animals that have endured torture and cruelty for most of their short lives. There is plenty of footage online now showing the sheer horror of intensive farming and the terrible cruelty that goes on in slaughterhouses before animals are finally killed. A classic example of speciesism is the serving of meat at rescue fundraising events. Volunteers do an amazing job devoting their energy and resources to doing all they can to helping needy dogs yet see no problem with holding BBQs or chomping away at a bacon or ham sandwich. At best this is hypocritical but thankfully things are changing with meat being off the menu now for many rescues. The trustees will no longer attend any GSDR function where meat is served. Is It Ever Okay for an Animal Welfare Organisation to Serve Meat at a Fundraiser? The question of whether or not it is ever okay for animal welfare organisations to serve meat at fundraisers should never be asked - it's simply not acceptable. Why Dog and Cat Rescue Shelters Are Taking Meat off the Menu at Fundraisers. In a world where we are seeing an increase in animal exploitation, it is our belief that all sentient beings should have the right to live freely and not have to die by the hands of humans. The exponential rise in animal exploitation of the animal kingdom goes hand in hand with humans exploitation of the environment and natural resources. We appear to have pressed that self-destruct button. The ancient traditions of the indigenous peoples such as the Native Americans and the Aborigines showed a deep respect and understanding of the natural world. They also respected their environment, they understood sustainability with a care for individual animals. They lived by only taking what was needed for their own survival. Humans have now become the only species hell bent on destroying the environment required for sustaining its own life. How is that for stupidity? The belief in reincarnation meant that the early Buddhist and Pythagoreans adopted the practice of not killing or injuring an innocent animal. Most humans believe animal welfare protects animals from suffering when nothing could be further from the truth. Take a trip around a factory farm where virtually all pork is reared or take a visit to a slaughterhouse if you want to see how animal welfare laws work. There is a very good reason why these places don't have windows and why they are hidden away from public view. The words humane and slaughter are mutually exclusive, no animal wants to die. 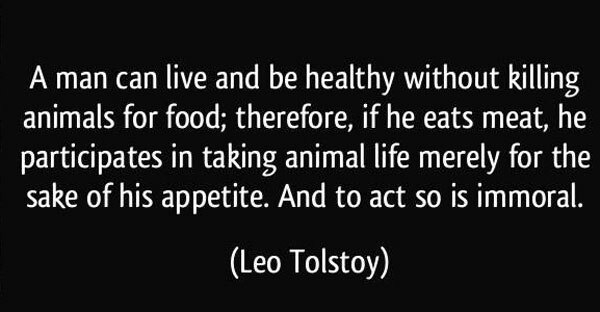 Animal welfare then should not be confused with animal rights, they are not the same. Animal rightists oppose the use of animals by humans although some accept symbiotic relationships such as the owning of cats and dogs as companion animals. Animal liberationists are viewed by many as extremists since they often have to break the law to release/rescue animals being subjected to extreme cruelty. Personally, we believe vivisection and fur farming etc are extreme. The term animal protectionist is perhaps most fitting for us as we seek to improve the status and situation of all animals. For this reason, we are vegan on moral grounds and do not consume or use any products that involve the suffering or death of another. We believe all creatures deserve our respect and should be protected to live their lives freely without suffering at the hands of humans. 1. No animal should be endowed with imaginary qualities of good or evil to satisfy our superstitious beliefs or religious prejudices. 2. No animal should be dominated or degraded to entertain us. 3. No animal should be kept in captivity unless it can be provided with an adequate physical and social environment. 4. No animal should be kept as a companion unless it can adapt easily to the lifestyle of its human owner. 5. No animal species should be driven to extinction by direct persecution or further increases in the human population. 6. No animal should be made to suffer pain or distress to provide us with sport. 7. No animal should be subjected to physical or mental suffering for unnecessary experimental purposes. 8. No farm animal should be kept in a deprived environment to provide us with food or produce. 9. No animal should be exploited for its fur, its skin, its ivory or for any other luxury product. 10. No working animal should be forced to carry out heavy duties that cause it stress or pain. Source: The Animal Contract by Desmond Morris. Warner Books. 1990. Philip Wollen: Animals Should Be Off The Menu. 'Meat today is the new asbestos, more murderous than tobacco. CO2, Methane and nitrous oxide from the livestock industry are killing our oceans with acidic hypoxic dead zones. 90% of small fish are ground into pellets to feed to livestock. Vegetarian cows are now the world's largest ocean predator. The oceans are dying in our time. By 2048 all our fisheries will be dead.The lungs and arteries of the earth. Billions of bouncy little chicks are ground up alive simply because they are male. Only 100 billion have ever lived, 7 billion live today and yet we torture and kill 2 billion sentient living beings every week.